Hi, I'm wanting to make my own okito box and Boston box, so the look identical, I'm not sure on brass or aluminium, and I'm not sure what currency or how many coins I want them to hold. I want to ask the question, what would be your ideal box set? Would a smaller box be a good or bad idea, maybe one that holds 5p coins? Want to make something special? My suggestion would be to think about what you are going to say when you first introduce the box. What is it supposed to be? Where did you supposedly get it? Then make it to match those qualities. It's always been interesting to me why the need to explain your props seems to be a proclivity of close-up performers but not of stage magicians. Pete McCabe wrote: ... think about what you are going to say when you first introduce the box. What is it supposed to be? Where did you supposedly get it? When you are sitting or standing two or three feet from someone, I can certainly understand the need to explain odd things you bring into play. Richard Kaufman wrote: When you are sitting or standing two or three feet from someone, I can certainly understand the need to explain odd things you bring into play. Indeed. Which is why I believe the original idea was that the Okito boxes were passed off to audiences as pill boxes, familiar items at one time. And not so rare today. Whichever, whether used much today or not, it's still something to consider. Admittedly some of today's efforts do look as if they've been constructed with one purpose in mind: a Magic Trick. All very interesting, thankyou very much. any thoughts on weather coins should be tight fitting? Or able to hold shells? And has anyone got any tips or advise for the box to have a slot in it? Even better if someone could send me a pm with some pictures? You may wish to consider his thoughts as you design your own. Also, as a respectful counterpoint, Roth doesn't even try to explain what an Okito Box is: in his presentation it's just a magic box. First, I really do not understand why explaining your props is so important. The way I have always seen it is that your audience is waiting to see the cool things you do with your magic props. There are exceptions such as introducing ordinary household items but other than that, they understand that you are displaying magic tricks and they want to see what you can do with them. No? As far as the size, etc. of a coin box, the answer to what is best is in the eyes of the user. That is, you need to trial and error all of the different types and see what you like best. I don’t think certain boxes are better than others because everyone has different preferences based on their experience and what they want to accomplish. Of course, the size of the coins you want to use will determine what box you need as well! For example, I prefer a box which is not too heavy, does the flip well, and I want the coins to fit more snug than loose but not so snug that they don’t release easily. I especially like a Boston box for obvious reasons but also use a standard Okito box as well. Type of metal has always been a cosmetic issue with me more than a needed type. Maybe contrast of coins to box is a consideration such as gold coins in a silver box. Of course, price can help to limit your choices unless that is not an issue. Once you know what your routine will be, you can then more easily make your selections. josh.smiff wrote: Hi, I'm wanting to make my own okito box and Boston box, so the look identical, I'm not sure on brass or aluminium, and I'm not sure what currency or how many coins I want them to hold. I'm assuming that you are in possession of a lathe and are a machinist, tool and die maker or similar. If that is the case you certainly have the necessary skills to pull it off. About 25 years ago I had a retired machinist make a custom set for myself. It wasn't anything revolutionary, but I had him add a couple of touches that I prefer. Mainly a slightly larger diameter to allow for rattling and looseness of the lid, which I find helpful for certain moves. My "perfect" box would be one that had thick walls, thick-ish bottom to aid in the turnover drop and rounded edges. The lid would have to have a little "slop", meaning it doesn't fit tightly. The lid would also be fairly shallow. I'd want a standard, a Boston and a slot box to match. I don't currently use a plug or undersized box in any routines, but I'd want them just in case. Regarding material, definitely not aluminum. I think they feel cheap. Too light for me. I would go with copper or bronze with brass being acceptable if need be. I don't think a contrast is necessary between box and coins but it could be argued that it helps visually I guess. I use half dollars but a couple of routines use English Pennies, so another reason to have a slightly larger diameter. Ray J wrote: ...My "perfect" box would be one that had thick walls, thick-ish bottom to aid in the turnover drop and rounded edges. The lid would have to have a little "slop", meaning it doesn't fit tightly. The lid would also be fairly shallow. I'd want a standard, a Boston and a slot box to match. I don't currently use a plug or undersized box in any routines, but I'd want them just in case. WOW! Ray, your "perfect" box description is the way I've been making them for the past five or six years. Good to know people like this design. 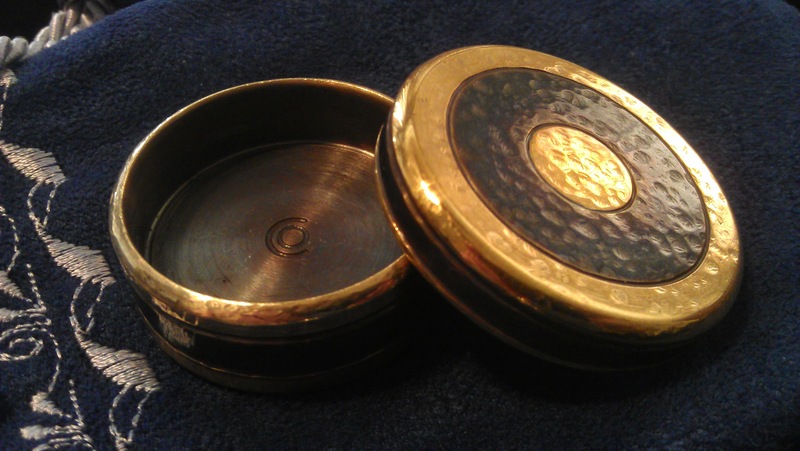 I also darken the inside and embellish the sides, lid, and boston recess for magicians that sneak the coin in and out instead of waxing it in there. Josh.Smiff - I can tell you from experience that a real b***h is rounding the edges on a plug(solid) box that has a polished middle band! Craig makes outstanding Okito boxes, worth checking into if interested in coin box effect. Craig's a great guy too (Craig send the $5 to my Paypal please). Craig, please PM me information on your product. It is indeed a beauty. Ray J, I don't suppose your last name is Johnson? Tom Gilbert wrote: Craig makes outstanding Okito boxes, worth checking into if interested in coin box effect. Craig's a great guy too (Craig send the $5 to my Paypal please). Amen, to that--- As I've written previously, Craig made a set for me that is just amazing. They not only look great, but they handle perfectly. They are heavy without being bloated and the extra weight makes them feel pleasingly solid in the hand. The balance just makes the moves very precise--you feel good tossing the box to the required positions. Coins sit perfectly on the rounded rim, and the box is taller than most, so rim steals are easier. I've been working on Roth's routine daily and It's like driving a well built car. I wasn't sure about the blackened interior when I first ordered them, but they really look sharp and the slot is darn near invisible, even to the operator. 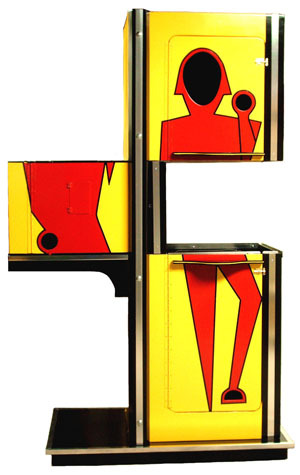 Fit and finish are superb--the boxes are classy, without being gaudy. Finally, Craig is all about customer service---he communicates quick and answers every question, no matter how silly, and he works fast! I really love these things! PS: Tom's the one who turned me on to these boxes, so Craig, you can send my $5 directly to Tom! Bob, Ray, I'll PM you guys so as not to derail this thread. If you're trying to make the "ultimate" box set for yourself or for the masses my suggestion is to (remember the first pancake is always a throw away) choose a coin type, get in your shop, and make *anything* that resembles an okito box that at least fits your preferred coins. Use whatever material you have. And then play with it. Toss it around. Toss it from one hand to the other. Get to know it. How does it sound? Hunt down and try out some box routines from Richard's book on David Roth's work, "Expert Coin Technique". David Roth advanced coin box magic by light years with that information in the 1980's. A good way to get comfortable with an okito box is to play with just one coin and a box. Cuddle up with it. Grab the coin and a box. Did you get the box from the table? From your pocket? Was the coin already in the box or did you have it in your other hand? What about the box would make this better? Is there a better way to do *ANY* of this? Get familiar with what's "new" in the box world. Box magicians that currently make me pee myself are Curtis Kam(Hawaii), Max Li(China), Juan Luis Rubiales(Spain), Joe Cole(The boonies), and long list of other names that belong here but I'm too scared to mention. From my experience I can say the worst part of trying to discover what you ultimately want and what others might only like or alternatively hate is what I call the "box of shame". 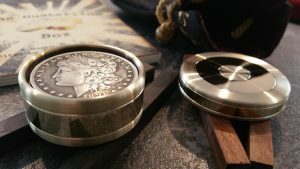 I have a *very* large box loaded with rejects of coin boxes I made for others and myself before finding what is what I thought (think) is the ultimate box. Some sound like crap. Some look like crap. Some feel like crap. Some are made from crap. etc.etc.etc. and funnily enough if you drop one that was pristine and ready to ship but now looks like crap you can choose to toss it or maybe get extremely angry about it. It will take years off your life BUT you may discover a new "look" by beating the crap out of it with a ball peen hammer (oh that feels SO much betta now). Hit it a couple thousand times and it could be a new look that you HATE to make! Richard Kaufman wrote: Ray J, I don't suppose your last name is Johnson?